I can be surprisingly forgetful at times. For instance, I left a roll of film (yes, it still exists) at CVS on Wednesday (Apr. 25) and returned to collect my developed pictures on Thursday. I discovered that I had two rolls of developed film waiting for me. Apparently, I gave them the other one on March 15. I must have forgotten about it in the preparations for my trip to Washington, DC (see forthcoming entry). On that older roll were several pictures from Markus & Stephanie’s visit to Columbus, so I have included them in this entry and re-posted it. On March 10, two longtime friends of mine named Markus and Stephanie payed a visit to Columbus. They have lived in Washington, DC for almost two years, and this was the first time I had seen them since my trip to Washington, DC in March of 2006. Our hosts were a married couple named Mark and Erin; they have been members of CGSA and friends of Markus, Stephanie, and I for many years. Above and at left you can see Erin demonstrating some of the skills that earned her a black belt in Taekwondo. In the photograph above she is in the middle of one of several demonstration kicks she performed that evening. The true extent of her skill and flexibility is more dramatically demonstrated in the photograph at left. Where is her left foot? The answer is that is it inside the blue-green sock you can see protruding from the far side of her head! Mark is in the background, standing in front of their fireplace demonstrating his own brand of dancing skills. 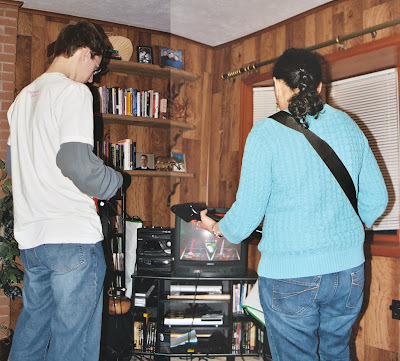 In the photograph below, you can see Markus standing to play Guitar Hero, which is a video game similar to Dance Dance Revolution, but it is played with the hands rather than feet. Arwen, who is very talented at playing real musical instruments, is sitting on the couch. Next on Guitar Hero, we have Paul and Jona. They are engaged to be married in the Philippines next year. This is Mark and Erin’s cute (and rather odd) cat Rikki. Erin named him after the titular mongoose in “Rikki-Tikki-Tavi” by Rudyard Kipling. This is one of their cute (and rather odd) examples of refrigerator magnet poetry. On the left is Erin; on the right is Arwen. In the middle is a Karaoke machine. While I did play Guitar Hero, my signing voice is not fit even for Karaoke. The dish on which everyone is focused is known as a “Cookie Monster,” which was the culinary highlight of the evening. To make this treat, one fills the bottom of a pie plate with a cookie. Ice cream, whipped cream, chocolate syrup, etc. are piled on top of the giant cookie. Two minutes later, after everyone has attacked the monster with spoons, it is gone. Well…it wasn’t really gone, it had been relocated into the stomachs of those in the photograph. Unfortunately, I had given up chocolate for Lent and thus could not partake. Even so, I was very glad to talk and eat with Markus and Stephanie, who are on the right-hand side of this photograph, again.